Are you wrecking your brain? of alcohol, cigarettes and caffeine on the mind. What exactly are you doing to your brain when you drink alcohol or coffee? If you think they can’t be doing much harm, the pictures on the opposite page may come as a shock. They show that the effects of long-term and heavy use can be just as striking as the damage caused by illegal drugs such as cannabis or cocaine. 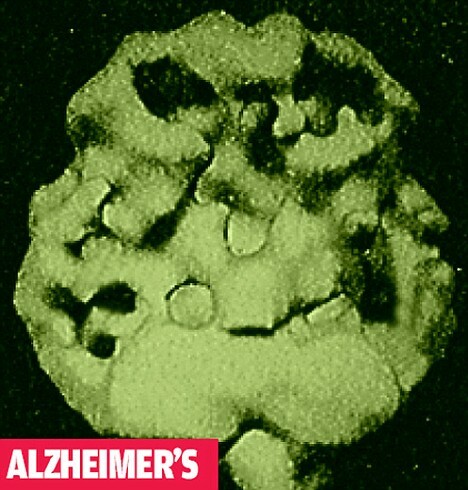 They can even result in a pattern of ‘holes’ in the brain similar to those caused by Alzheimer’s disease. The images come from a remarkable new book - Change Your Brain, Change Your Life. Undeniable: Caffeine is widely seen as relatively harmless - but these drastic images will make even habitual coffee drinkers rethink. Already a bestseller in the U.S., it was written by neuroscientist and psychiatrist Daniel G. Amen, who is professor of psychiatry-and human behaviour at the University of California, Irvine, and director of the Amen Clinics. In the book, he explains how behaviour such as anxiety, anger or impulsiveness could be related to the way specific areas in your brain work. For the past 15 years he has been using scanning technology to assess brain activity in people with ‘psychological’ problems. What these scans have shown is that often these problems are not actually psychological, but are biological - some area of the patient’s brain isn’t functioning well, but is instead under or over-active, he says. Sometimes this ‘ malfunctioning’ can be due to substances, illegal or legal, which effectively shut down the blood supply to areas of the brain. Here we see a scan of a healthy brain, taken as if through the roof of the mouth. 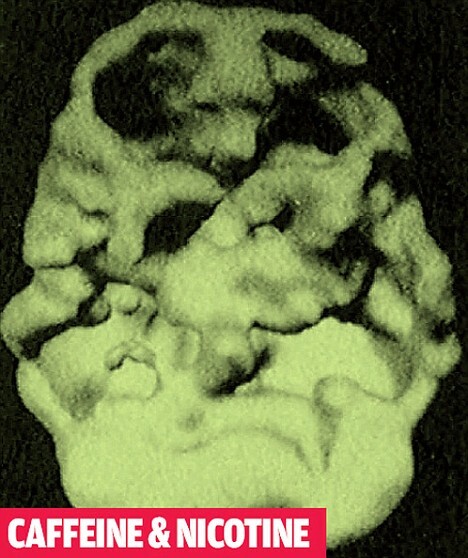 All the images on this page have come from a SPECT scanner, which shows brain activity by detecting blood flow (unlike other types of scanner, which show the actual structure of the brain). The largely smooth surface shows that blood flow to this brain is good. Compare this with the pits and disruptions seen in the other images on this page, where there is poor or no blood flow in the brain. This can have a dramatic effect on behaviour, depending on which area of the brain is affected. Often these behavioural changes will be blamed on a psychological problem, when, in fact, there is a genuine biological basis for them. It is a frighteningly eloquent warning of the damage we often voluntarily inflict on ourselves. This reduces activity in these areas, and, depending on the area affected, this affects the patient’s behaviour. The caffeine and nicotine scan opposite is of the chief executive of a large company whom Dr Amen knew socially. ‘He came to see me complaining of low energy and a difficulty concentrating,’ says Dr Amen. 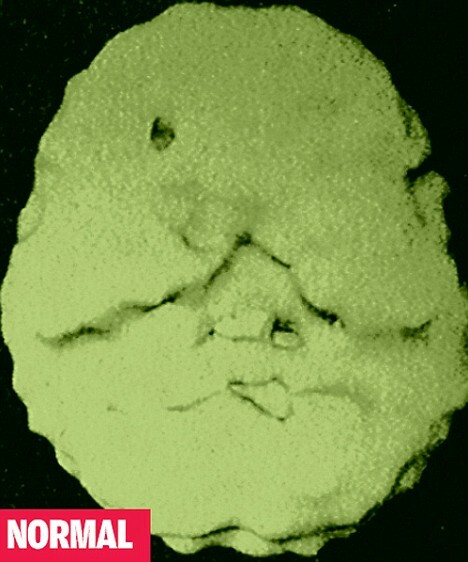 The brain of this heavy caffeine and cigarette user looks in an even worse state than the drug users and heavy drinkers. Caffeine and cigarettes are stimulants in the short term, but in the long term they can narrow the blood vessels in your brain. This reduces brain activity, especially in the vital pre-frontal cortex and temporal lobes. The two large black holes at the top of the brain are in the prefrontal cortex - just under the forehead - which is the brain’s boardroom. This is where you learn from your mistakes; damage here makes you vulnerable to depression. The distorted temporal lobes (the large gaps in the middle) are linked to poor memory. This patient, a company chief executive, had complained of lack of energy and trouble concentrating. Dr Amen recommends no more than three cups of coffee a day, limited tea, fizzy drinks and chocolate, and giving up smoking. Just how much brain damage coffee or alcohol will cause in any individual varies hugely - some people can handle a lot while others are far more vulnerable, says Amen. As a result of his work, Dr Amen avoids any kind of stimulants. ‘When I was 16, I got drunk on a six-pack of Michelob beer and half a bottle of champagne and was sick for three days,’ he says. When this patient saw what his drinking had done to his brain, he burst into tears. Until then, he’d denied there was a problem. Large amounts of alcohol close up blood vessels in the brain, causing cells to die off, especially in the prefrontal cortex - these ‘dead spots’ are the two craters you can see at the top of this picture. The prefrontal cortex directs and supervises your behavior - damage can lead to poor judgment, weak control of impulses and an increased risk of depression. Alcohol can affect temporal lobes frighteningly quickly - Dr Amen has seen 18-year-olds who have signs of serious damage in this area (the circular areas in the middle). Your temporal lobes are where you process language, music and, crucially, memories and mood. Too much or too little activity in this areamakes you unpredictable and moody - just the kind of behaviour that alcoholics exhibit. He also runs a programme in Californian schools to make children aware of what recreational drugs can do to their brains. Indeed, you might argue that those who want drug classifications loosened should also look closely at these scans. The scanner that Dr. Amen uses is known as SPECT (photon emission computerised tomography) and is specially useful for showing brain activity. Just as recreational drugs reduce brain blood flow, so does Alzheimer’s disease. The sticky plaques that are a sign of the disease cause short circuits between brain cells that then block blood flow. This picture shows that the damaging effect is also particularly noticeable in the temporal lobes - the area where you process language and memory - as it is with drug use. More familiar brain scanners such as PET and MRI can show the structure of the brain in greater detail but they don’t tell you what it is doing. If the brain was a town, these scanners would show the buildings while SPECT reveal the actual traffic flow. SPECT scans are also widely used to check for cardiac disease as they can reveal problems with the flow of blood around your heart. 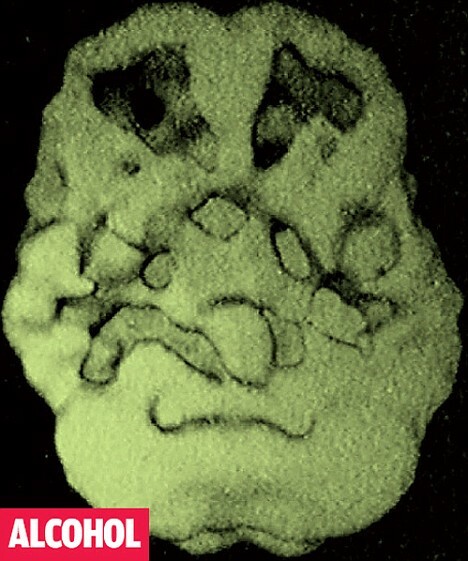 Before the brain scan, the patient is injected with a compound which contains a minute amount of radioactive material - about as much as is found in a standard chest X-ray. Once in the bloodstream, it attaches itself to brain cells. Then for 15 minutes the scanner slowly rotates around the head building up a 360-degree image of the brain that can be viewed from any angle. This should come as a shock to those who want to downgrade cannabis from a class B to a class C drug. Like other recreational drugs, cannabis squeezes down blood flow, leading to brain cell damage and death. Dr Amen’s research has found that it particularly affects the temporal lobes - the greatly enlarged black spots on either side of the middle of the picture. This area is responsible for memory - could this, he wonders, be a reason for the poor memory and lack of motivation that chronic users often report? This patient was a 16-yearold boy who had used marijuana every day for two years. 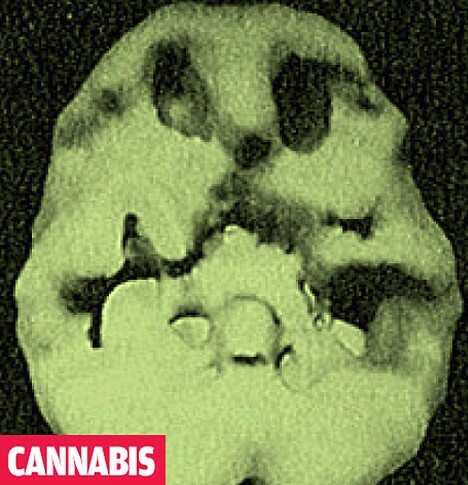 The scan came as a great shock to him and his father, who was a doctor and strongly opposed to recreational drugs. In the images on these pages, you can see ‘dead spots’ - where there is no brain activity because of little blood flow - revealed black holes. Depending on the location of these dead spots, the patient's behaviour will change. For instance, if these occur at the front of the brain, which controls forward thinking , your sense of judgment deteriorates. When it comes to the effect of caffeine and alcohol, the good news is that once you stop taking them, the brain recovers (and the same may be true for other substances). • Change Your Brain, Change Your Life: The Breakthrough Programme For Conquering Anger, Anxiety And Depression by Dr Daniel G. Amen is published this month by Little, Brown at £12.99. To order a copy (P&P free), tel: 0845 155 0720.